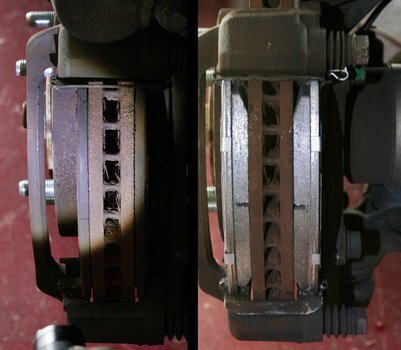 Learn how to change brakes on a first-generation (2003-2006) Kia Sorento. 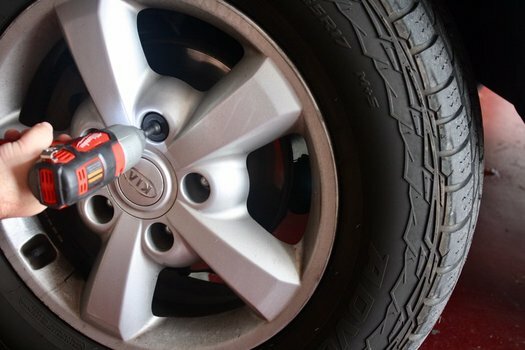 I'll outline all the parts, tools, and tricks you need to change brake pads and rotors on a Kia Sorento. This Kia is owned by my friend Sam. 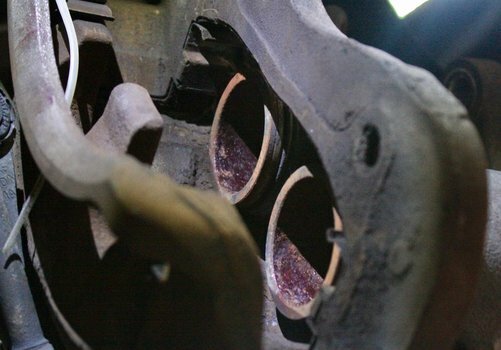 He was warned by a shop that his pads were getting paper thin and suggested replacing rotors, pads, and brake fluid. We decided to save some cash and do it ourselves so we could write this article for the rest of you to use as a guide. 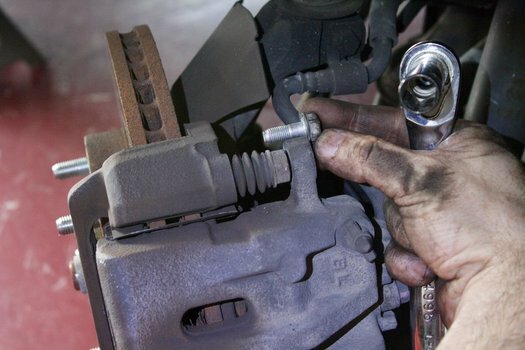 It turns out it's a pretty simple job most owners could do themselves AND save money even after buying the required tools. Jack up the side of the car your working on. The 1st generation Sorento has a truck frame which makes finding a jacking location easier then unibody vehicles. Place the jack pad on the frame rail about where the front of the door is. 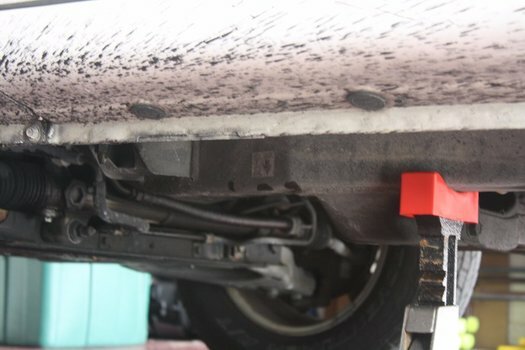 Make sure you leave room for your jack stand and choose a good spot where it's not likely to slip off. I'd recommend using a set of wheel chocks to keep you safe as well. Remove the wheel. The lugs are 21mm. Using 14mm socket and wrench to remove the 2 caliper slide pin bolts. Slide the caliper off the rotor and caliper bracket. Be aware of the short rubber brake hose - try not to stretch or over-stress the hydraulic hose. Sometimes you may need to wiggle or persuade the caliper to slide off due to the pads adhering to the caliper and potentially deep grooves in the rotor. 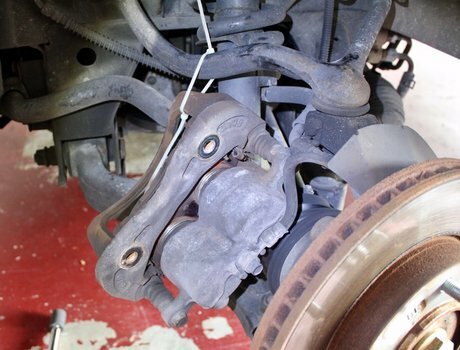 Remove the brake pads by sliding them out of the thin metal retainers. Warping that causes vibration during braking. Too thin due to wear. Remove the 2 larger 17mm Bolts that hold the caliper bracket on. Remove the 2 Philips Head rotor set screws. Brake rotor set screws get stuck. They'll strip, break screw drivers, and leave you in a bind. They almost always prove to be a pain to remove. There are all sorts of tricks and backup options to removing them, but I wouldn't plan on replacing rotors without the option of drilling them out to fall back on. Spray them with WD-40 or PB blaster. Then try using a manual impact driver. These drivers are awesome for tough screws like rotor set screws. You can try a hammer and punch, 2 hammer approach, or just drill the head of the screw off entirely. The wheel lug studs stay attached to the hub while the rotor slides over them. If the rotor isn't loose, you may need to persuade it with a hammer. Clean and install the new rotor. 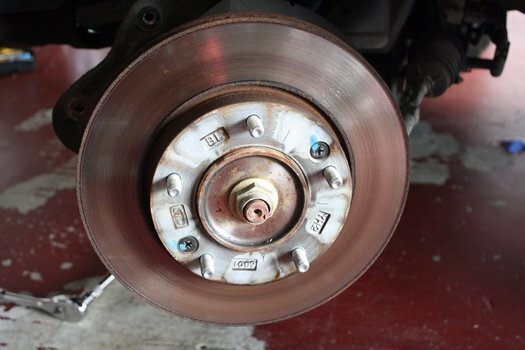 New rotors are usually covered in a layer of oil to keep them from rusting. Clean them with a few sprays of brake cleaner. Install the brake rotor retainer/set screws. They really aren't needed for anything other then keeping the rotor on during assembly. If you don't want to go through the trouble, it's fine to leave them off. Install the brake caliper bracket. 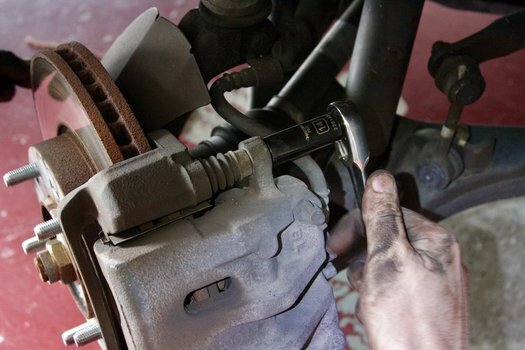 Using a brake pad spreader or large c-clamp, press the brake caliper pistons all the way back into the caliper. Keep an eye on the brake fluid reservoir level at the top. If anyone's added brake fluid - pressing the pistons back in will cause it to overflow. 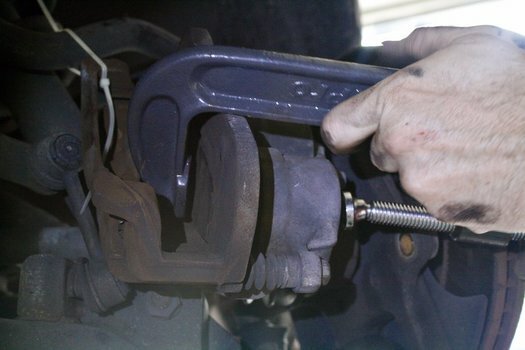 Now's a good time to inspect the rubber caliper boots for any wear or leaking. 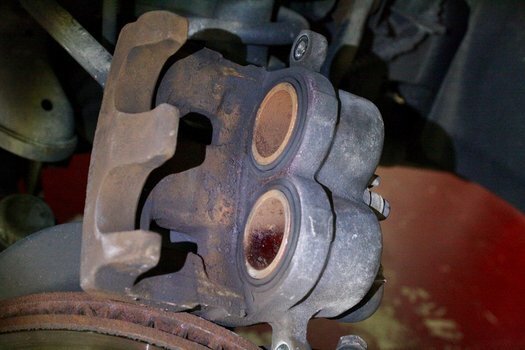 If there's an issue there, you'll have to rebuild or replace the caliper. It's considered best practice to loosen the bleed screw when spreading the pads. Theres legitimate concern that the dirtiest brake fluid near the caliper could cause issues being pushed back through the system. That said, there's certainly many shops and DIY mechanics that don't do this. 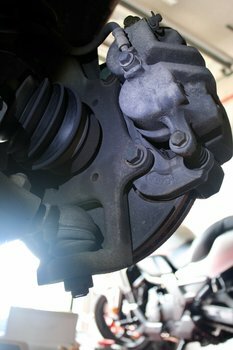 If you're worried about it, instead of simply spreading the calipers, you can loosen the brake bleed screw while spreading the caliper. Note that doing so may require you to bleed the system when you're done. Load the Pads into the caliper bracket. Each caliper should have a pad with a wear indicator and a pad without. In our case, the one with the wear indicator was the outer-most pad. You can see the marks from the caliper and pistons left on the old pads to help you figure out where they were before you removed them. You may wish to replace the brake pad hardware (those thin metal clips that actually hold the pads). If so, now's the time. Many pads come prepared with anti-noise coating on the pad backing plate, but they do make products you can add yourself. If you wish to use that, add it to the backing plate of the brake pad now. 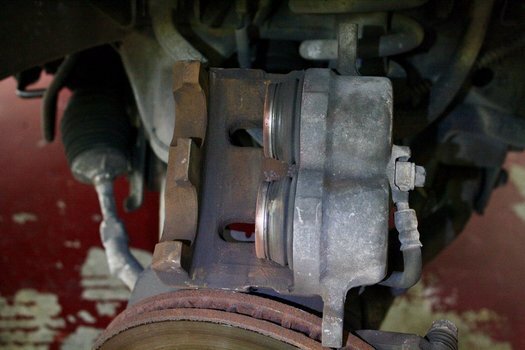 DO NOT add it to the brake pad surface that touches the disc. Inspect the caliper slide pins, and grease if needed. They should slide freely and very smoothly into the caliper. Also Check the rubber boots to make sure they don't need to be replaced. It's not a bad idea to re-grease the slide pins every pad change, but it's not critical. Install the brake caliper over the pads. Install the caliper slide retainer bolts. Carefully guide these bolts into the caliper trying not to cross thread them. Ideally they'll just line up, but I found I had to hold the press the caliper around a bit with one hand while using the other to screw in the bolt. Lower the vehicle and test the brakes.